After 12 years of anticipation, the tallest skyscraper in the Western Hemisphere was ready for its closeup. 10,000 workers lifted 104 floors, gave new life to an international symbol and created one spectacular view. 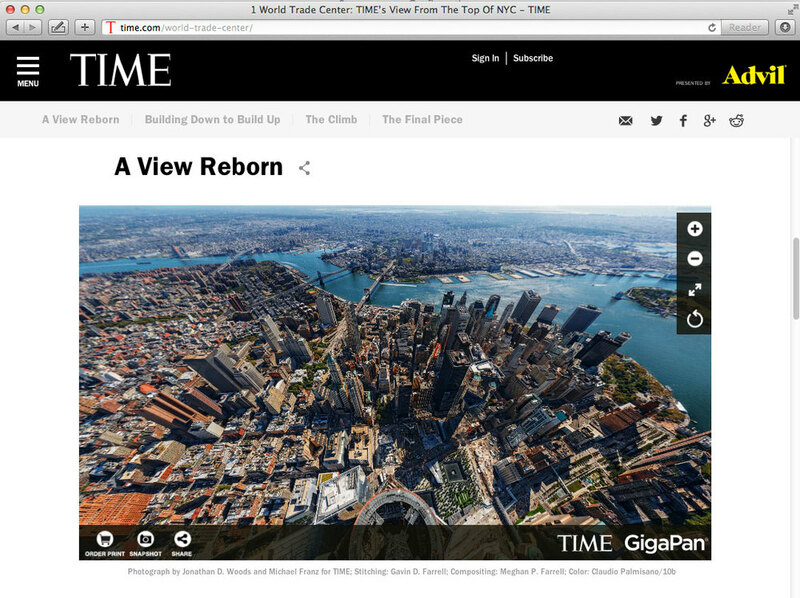 When the moment was right Gigapan and Time Magazine partnered together with the goal of creating an interactive panorama with a viewpoint suspended 10’ out from the spire. On March 6th 2014 it went live across newsstands and the internet. It is humbling and with great pride that my wife Meghan P Farrell and I were able to be an integral part of creating this historic and massive image. 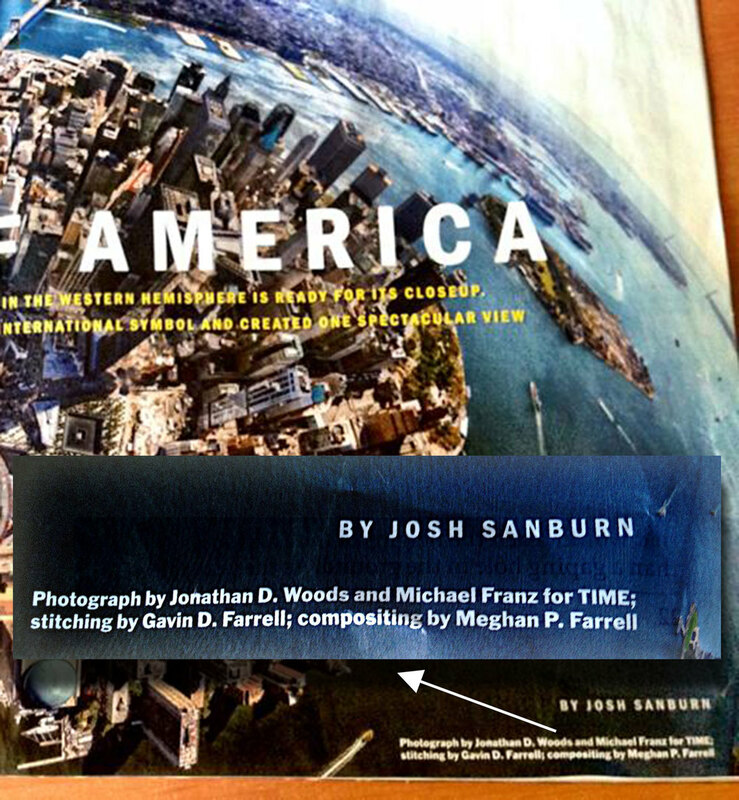 Thank you Michael Franz, the photographer, for coming to us and the senior photo editor at Time for trusting in us! All In all the most important thing is that we honor those who were lost and risked life and limb for others. Let's remember all of those great people in New York! 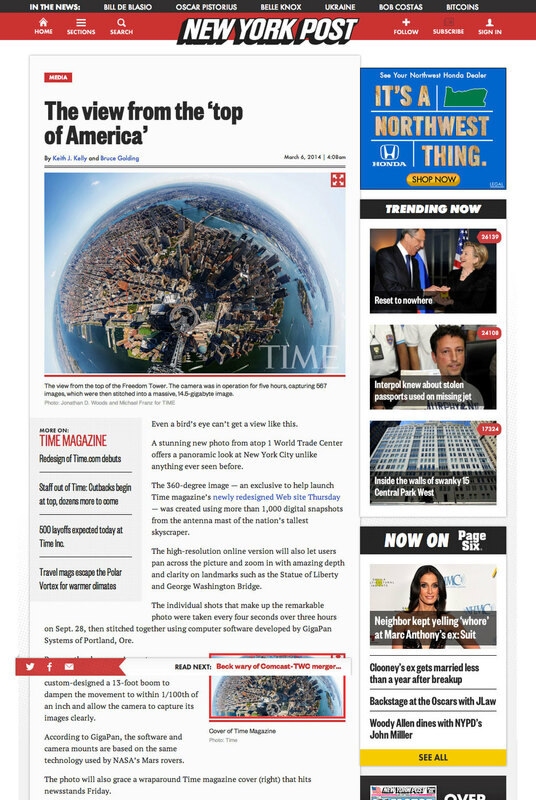 Michael Franz and I will be presenting FROM THE SPIRE – CREATING THE 1WTC TIME MAGAZINE GIGAPIXEL PANORAMA at the IVRPA 2014 Conference this year in Las Vegas. If you're interested to learn more about this amazing project and meet the people behind it's creation we hope you can join us. PURCHASE TICKETS TO THIS YEAR'S INTERNATIONAL VR PHOTOGRAPHY ASSOCIATION IN LAS VEGAS.